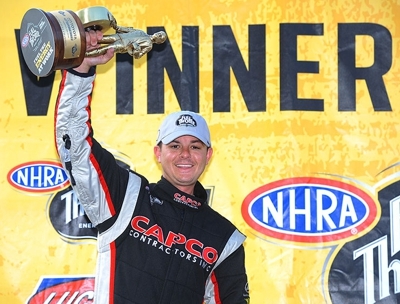 June 3, 2012 -- Steve Torrence’s Top Fuel driving prowess – and a strong race car – carried him to his second NHRA Top Fuel victory Sunday afternoon at fabled Old Bridge Township Raceway Park in Englishtown, N.J.
His title-round decision over Brandon Bernstein in the Toyota SuperNationals was his second win in the last three races. His first was May 6 at Atlanta. This Torrence Racing one-car team continues to prove it belongs among the championship contenders after only nine races. Torrence wasn’t intimidated with seven-time champion Tony Schumacher and series point leader Spencer Massey on his side of the ladder. When it came time to deal with them, he did. The first-year team owner from Kilgore, Texas left the line first and got the win light about six inches in front of Schumacher in the second round. His time was 3.838 seconds at 319.76 mph to 3.809 at 319.75. Torrence’s reaction time was .070-second to .107-second. Massey, who set NHRA Top Fuel elapsed time and speed records during qualifying did get a .072-.074-second edge and he, too, trailed by about six inches at the finish line. When it got down to the finals, Torrence said he was ready. “I was pretty pumped up when I raced Brandon. I knew crew chief Richard Hogan and the guys gave me a good race car and I just wanted to beat the car sitting next to me. “I looked up at the scoreboard and saw the 3.80 come on. It took a little bit for the win light to come on beside it. I was saying ‘come on, come on.’” The time was 3.800 seconds at 323.66 mph to 3.807 at 321.04. The march to the winner’s circle began when he eliminated Bob Vandergriff, 3.8708 at 323.35 mph to 3.862 at 320.58. Torrence remained fifth with 644 Full Throttle series points.